Round 2 of The Escapist's Reader's Choice GOTY 2013 Begins - Vote Now! What does Tomb Raider, Mario and XCOM have in common? They all got voted out of the Reader's Choice Game of the Year 2013 tournament! But there are 8 amazing games left to fight it out. Round 1 of the tournament bracket for the Reader's Choice GOTY 2013 is in the books, and there were a few upsets. Papers, Please soundly defeated XCOM: Enemy Within, and Assassin's Creed IV: Black Flag pulled out a win against Saints Row 4. You can see all the results, including final vote counts, here in the forum for Game of the Year. There are new intriguing matchups in the next round, with Papers, Please up against StarCraft 2: Heart of the Swarm and Pokemon fighting it out with The Last of Us. 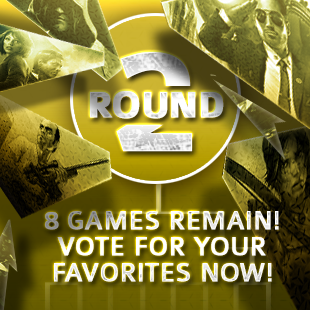 Round 2 voting is open now, so head over to the official tournament bracket to let your voice be heard! Many people think GTAV is a shoo-in for many people's Game of the Year choice, but Assassin's Creed has a pirate ship going for it. There's no denying the technical achievement of GTAV, no matter your opinion on the shitbag main characters, but the sheer fun factor of piloting your ship over the waves of the Caribean in AC4 might be enough to offset the popularity of Los Santos. Talk about this matchup in the forum thread here. Which game do you think deserves to be Game of the Year? The PS3 exclusive against the 3DS exclusive! Sony vs. Nintendo! This matchup may have the most differing games in terms of genre, but there's a lot to consider. Should the excellent story-telling and world-building of a new IP like Last of Us prevail over the tried-and-true formula of Pokemon? Original story-telling usually trumps endless iterations. On the other hand, this new generation of Pokemon is better than ever. On the third hand, plant zombies! Decisions! And of course, there's always BioShock: Infinite vs. Battlefield 4 ... I wonder which game is going to win that one? Head to the official tournament bracket to vote in all four matchups now! Voting is open until Tuesday, December 17th until 11:59pm EST, so you have seven days to rattle the chains and get yoru friends to vote for the game you think should be The Escapist's Reader's Choice Game of the Year 2013!